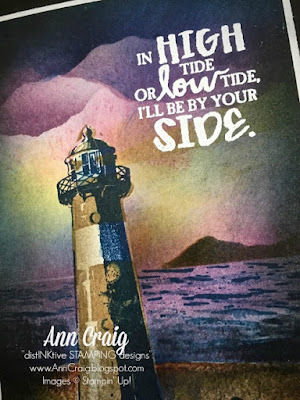 Ann Craig - distINKtive STAMPING designs - Stampin' Up!® Australia: Create a Seaside Scene With High Tide Stamp Set. 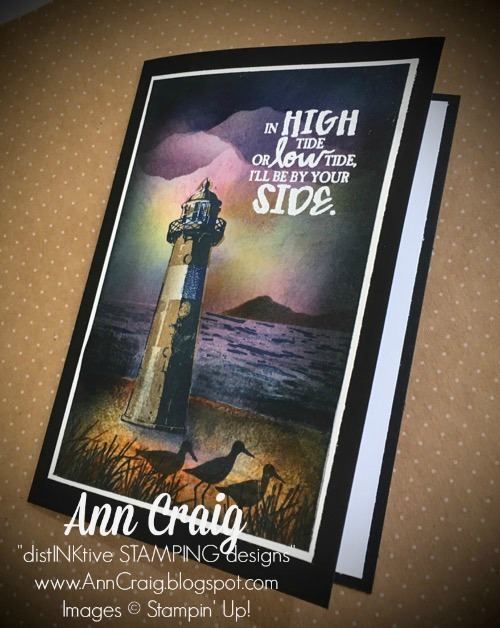 Create a Seaside Scene With High Tide Stamp Set. I love working from scratch and creating scenes with my inks and stamps, and the High Tide set by Stampin' Up! does not disappoint. I envisaged a stormy late afternoon for this scene, and used a combination of techniques including: sponging, masking, water colouring and stamping. 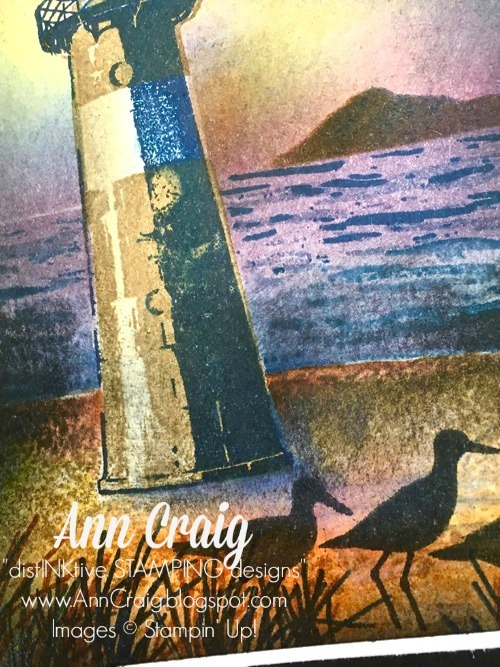 The colour palette I used consists of the following Stampin' Up! classic ink colours: Daffodil Delight, Marina Mist, Cajun Craze, Sweet Sugarplum, Perfect Plum, Night of Navy, Soft Suede and Memento Black. I created a mask for the light house and the lower half of the scene and started to sponge with the lightest colour first. I built up storm clouds using a mask torn from scrap paper, and created the headland in the distance using another torn piece of paper as a mask. You can give an indication of falling rain by swiping your sponge loaded with a darker colour, in the one direction. Then I stamped the water in Marina Mist and Night of Navy, plus I added sponged Sweet Sugarplum and Night of Navy. the foreground is stamped in Daffodil Delight and Cajun Craze, and the light house is stamped in Soft Suede and Night of Navy. I then dragged a little Suede ink across the white bits to soften the effect. The grasses at the front are stamped with Cajun Craze and Navy and the birds are in Memento Black. 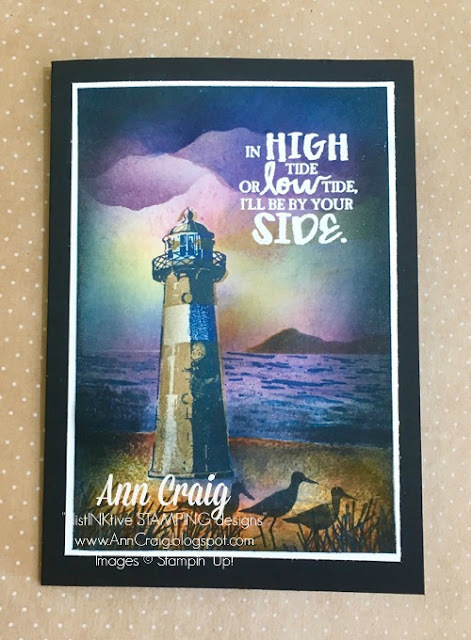 To finish off the card I heat embossed a sentiment in White Embossing Powder, and matted the image onto white before adhering it to a black card base. Sale A Bration has now finished, so I hope you did not miss out on your favourite set. The good news is a new Annual Catalogue is due in just 2 months. Lucky me will get to see and pre purchase from it next week!!. That is one of the Demonstrator perks if you go along to On Stage. I love On Stage (used to be called Convention) and have not missed one in my 10 years as a demonstrator. If you would like to be able to see and purchase items before everyone else you can join my team - it is such a fun way to fund your hobby, and if you wish, to earn additional income.